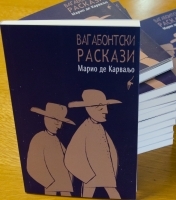 Within the scope of the challenge of the internationalization of SPA authors and the creation of GAPPA, a contract for the Macedonian language edition of 'Contos vagabundos' by Mário de Carvalho was signed with the publishing house Begemot Dooel Skopje, in Macedonia. The publication of the work in Macedonia will count on the support of DGLAB through its program of incentives to the translation of Portuguese authors' works. In Portugal the work has several editions and it is recommended by the National Plan of Reading for adults training, as a reading suggestion.